I hope your are the right person to write. On the blog "Shroud of Turin blog" there was an article on november 2, 2011 "A Reaction to Giulio Fanti’s Suggestion" there ist also a photo. I’m part of a student group at University of Hannover, Germany planning an exhibition about a seamless shirt in Steinhude. For this would like to design a map of europe with all the seamless clothes we found during our research and we would like to use the pictures. Who has the licence of this photo and can allow us to use it? No, I don’t know who has the license for the photo. You might try doing a Google image search on tunique d argenteuil. From there you can try all the many websites who are using the image. Such is the nature of the internet. Moreover (at least in the U.S.) the image may not be copyrightable just as photographs of the shroud are not according to the U. S. District Court for Southern New York which has held that exact photographic copies of public domain images could not be protected by copyright. 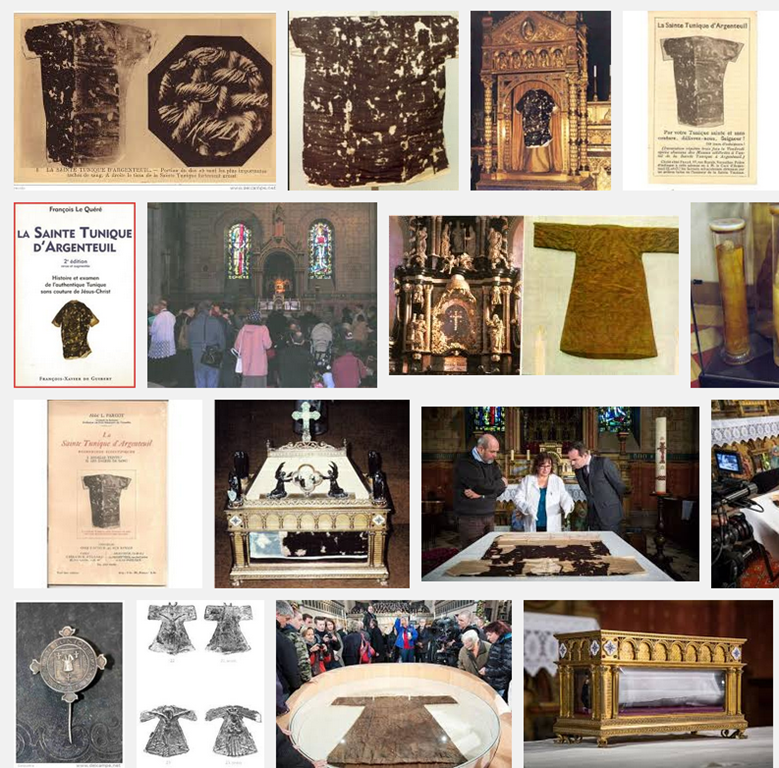 With regards to the SSG posting about the Argenteuil robe and carbon dating by Giulio, I am speechless. Good grief. In the Catholic Church there are two competing claimants to the title of the seamless robe or chilote of Christ. Legendary accounts of the robe at Argenteuil’s provenance has it being given by the Byzantine empress Irene to Charlemagne in the 9th century. In other words it came by way of Byzantium. The earliest extant written records go back only to 1195 and describe it as a child’s garment. We can’t know otherwise by looking at it because it was cut up into many pieces during the French Revolution and each piece was hidden away in a different secret location. Today only few pieces remain that have been seamed together. Some do claim that it is the seamless robe but there isn’t any good evidence for doing so. A robe at Trier is an alternate claimant. Like the Argenteuil robe it only has a certain documented history that goes back only to the 12th century, though legend takes it back to St. Helena. Over the years it has been repaired and patched so much that it is hard to tell what might be authentic and what might not be. It is as good a candidate as the Argenteuil robe. The claims don’t end there. Allegedly, the robe, or at least some piece of it, is to be found in the Patriarchal Svetitskhoveli Cathedral in Mtskheta, Georgia, brought to that city by a Jewish Rabbi called Elias who bought the entire robe from a soldier who was present at the crucifixion. It is as good a story as any and I suppose it more likely true than the other stories. Portions of this robe are found at the Cathedral of St. Peter and St. Paul in St. Petersburg, Kiev’s Sophia Cathedral and the Moscow Cathedral of the Dormition. The Shroud of Turin, on the other hand, has a respectable history going back to the Hymn of the Pearl, the letters of Sister Egeria, the Mozarabic Rite, John of Damascus, the capture by Curcuas and the subsequent witness of Gregory Referendus and Constantine VII and the Pray Manuscript. All of this would be almost worthless information were it not for the distinct, still inexplicable image on the Shroud. The Sudarium has a reasonably well documented history back to the seventh century. From bloodstains there are reasons to believe that these two cloths covered the same body at about the same time. The idea that they might have been forged, both or one or the other, to have such similar bloodstain patterns is implausible to anyone who traces their possible paths during the Medieval. 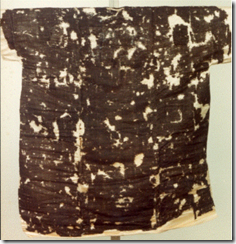 The Shroud and the Sudarium have been carbon dated with very dissimilar results. There are valid reasons to doubts the correctness of those dates independent of their differences. To throw the Argenteuil robe into the mix with the Shroud and Sudarium and claim that a series of undesirable radiocarbon dates suggest some supernatural aura attached to Jesus as a source of c14 rejuvenation is preposterous beyond scientific embarrassment. If there was ever any doubt that the survival of the Shroud of Turin was a singular event and an act of providence (Divine or otherwise) it’s the fate of the seamless robe(s) should remove it.. While the Savoy family did in fact make gifts of pieces of the Shroud, they were quite small, taken from the edges and apparently they avoided the image area and the blood. Not a big fan of royalty but it’s had not to see the hand of providence in the survival of the Shroud until a time when science could unlock its secrets. What happened to the seamless robes(s) is what I call the Central Park Effect. It has been said that if everything ever proposed for Central Park had been approved, the Park would have been cemented over 50 times or so. Incidentally there has been some uninformed critique of the Quad Mosaics that they were originally black and white and them colorized. Microspectral digital imaging begins with black and white images also BUT the three images are taken with RGB filters and then combined for single color image. IT’S THE FILTERS THAT COUNT. So please no self proclaimed scientists objecting that the original photos were just black and white. Incidentally, on the Lumiere web site is a video explaining the process as developed by them. It is copyrighted so you will have to see for yourself. They apply their work to paintings but I believe the multi-spectra digital imaging is certainly applicable to the Shroud. Watch the video and reach your own conclusion if you are interested. Lumiere is not the only company that does it. I went on your website and see that the Shroud of Turin is not the only thing that catches our mutual interest. There’s also JFK’S assassination. Before reading your post I thought that you would praise the Warren commission but I soon realized that I was wrong . It seems that we can’t agree about anything unfortunately and I disagree with you once again. Disagreements are what makes for horse races someone once said. I find t not at all unusual that someone who accepts the conclusions of the Warren Commission would accept the carbon dating. “Incidentally there has been some uninformed critique of the Quad Mosaics that they were originally black and white and then colorized.” It seems that Barrie Schwortz is the origin of this uniformed critique. In “https://www.shroud.com/pdfs/quad.pdf” he makes it perfectly clear that the Quad Mosaics were indeed originally black and white and then colorised. They were indeed taken through different filters, so that each black and white original contained information relating to colour, but the colour later assigned to each photo, or combination of photos, after scanning, required extensive manipulation, as he describes. To call them multi-spectral digital images is a little more generous than they really deserve, in my opinion. I didn’t intend to equate the 1978 Quad Mosaics quality and detail to the results of Lumiere’s process which is much more complex and involves 13 spectral photographs instead of 3. The Lumiere study of the Mona Lisa was more than 25 years later. The science of multispectral digital imaging had advanced. The Lumiere system measured composition across the complete light spectra from invisible infrared to invisible ultraviolet. A comparison of the Luimiere process to the Quad Mosaics is like comparing a 2015 Rolls Royce to a 1917 Model T Ford. An explanation of the process of the Quad Mosaics’ creation can be found at http://www.shroud.com/pdfs/quad.pdf. While I referred to the three spectra as R/G/B, the article by Barrie Schwortz reverses the three spectra as B/G/R. In sum, the 1978 Quad Mosaics were in fact the result of an examination of the spectra of the Shroud using three filters B/G/R. There is evidence that samples of the Shroud cut primarily from the frayed corners were gifted by the Savoy’s to those royal houses and individuals it favored. I would think that you would agree that a carefully conducted, non-intrusive multi-spectral digital image examination of the Shroud conducted to standards such as those used by Lumiere would be of enormous value, not just to scientists, but to history. Referring to the original Nov 2, 2011 posting: I find the Hymn of the Pearl persuasive, particularly Markwardt’s explanation for its composition; Egeria letters, Mozarabic rite, John of Damascus, at least suggestive; Capture by Curcuas very likely irrelevant (refers to Mandylion); Constantine VII, Gregory Referendus refers to Mandylion; Pray manuscript persuasive; Not mentioned – Robert de Clari, convincing; Other Byzantine references to “Image of God Incarnate” etc, very much more persuasive.